WorldCat is a worldwide union catalog created and maintained collectively by more than 25,000 member institutions. With over 246 millions of online records built from the bibliographic information of thousands of academic, public, special, national contributing libraries around the world, it is the foundation of many Online Computer Library Catalogue (OCLC) services. WorldCat provides catalogue records for books, maps, sound recordings, films, archives, and computer files held in libraries, as well as museums, archives and historical societies. This service is available to libraries and library groups that maintain a subscription to the WorldCat database via the OCLC FirstSearch reference service (electronic access to dozens of databases and more than 10 million full-text and full-image articles). For these member libraries and their users, all searches in the catalogue can be easily printed, downloaded or e-mailed. 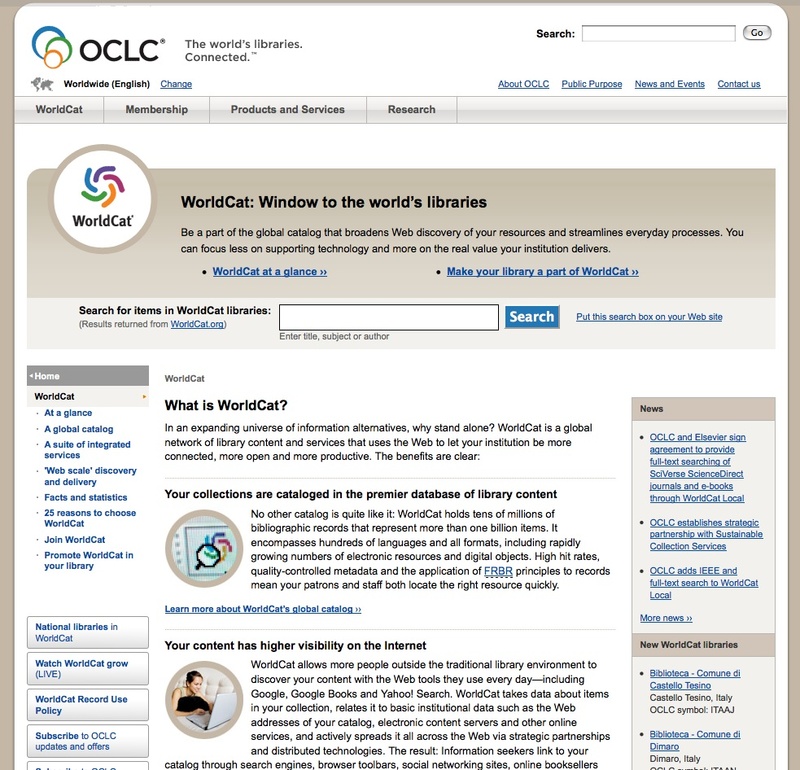 Visitors to WorldCat webpages (part of the OCLC website) can only retrieve information about this service and other OCLC products, whilst subscribers can entirely access the whole catalogue. Navigation is quite easy in these webpages but no material can be retrieved for immediate researches and data collection. This website, as well as the general OCLC website, are especially useful for librarians and institutions of any size and orientation.